Likewise Covenant Ministries was born by the prayer of saints on August 6th 2011 among many witnesses and was in the state of Florida registered as a not for profit organization on August 18th 2011. Likewise Covenant Ministries will carry out its mandate as directed by our Lord Jesus Christ in the parable of the Good Samaritan in Luke 10: 37 from which our name was derived. We will go into the villages and disadvantaged area of 3rd world countries and under served places around the world. Ayoade Omoladun Olaoniye was born on August 1, 1961 in Lagos, Nigeria to Alhaji Raji Adeagbo and the late Alhaja Sifawu Adeagbo. Ayo went to elementary school at Yaba Methodist Primary school. She obtained her high school diploma from Eva Adelaja Girl’s Grammar School, Lagos and obtained both Bachelor and Master of Science degrees in Chemistry in 1987 from the University of Lagos. 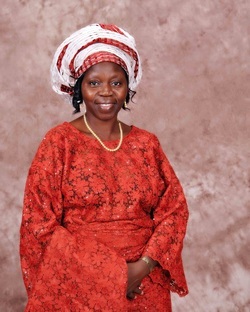 She became a born again Christian at the University of Lagos in 1981 and has remained a passionate follower of the Lord Jesus Christ to this moment. She and her sweetheart Ajibola Toyin Olaoniye married on April 9, 1988. The union is blessed with three boys Mobolaji, Ololade and Toluwani (Late). She migrated with her husband and children to the U.S. in August 1996. On arriving in the U.S., Ayo went further in search of knowledge and obtained a Master of Business Administration from Temple University in Philadelphia in 2000. She and her family then moved to Tampa, FL and then Orlando, FL. In Orlando she has worked in many endeavors, some of which were computer programming, teaching and entrepreneurship. In 2006, Ayo took her love of children to heart as she bought and began to run a daycare center. It is this experience, joined with her achievement of receiving her diploma in Theology from Faith College in 2011, that has cemented Ayo’s decision to serve the Lord and children of the world through her new ministry, Likewise. Oluwakemi Olufunmilayo Olusanya was born on November 6, 1965 in Lagos, Nigeria to (Late) Engr Edward O. Bankole and (Late) Mrs. Florence Aduke Bankole. Olukemi went to Elementary at African Church Central Primary School Agege Lagos. She obtained her high school diploma from Reagan Memorial Baptist Girls Secondary School Yaba Lagos and obtained a Bachelor of Science degree in Statistics in 1988 from University of Ibadan, Nigeria. Olukemi was born into a Christian home and a strong Baptist but became a born again Christian in 1980. She and her sweetheart Olusolabomi are married and the union is blessed with three children (two girls and one boy) Olubola, Olufolakemi and Olusolabomi (jr). She migrated to the US from England with her husband and daughter in August 1997. On arriving in Tampa, Florida, USA, she was home with her daughter and had her second daughter in 1999. She went on to pursue her dream of being a teacher. She served with the School District of Hillsborough County as a mathematics teacher in the middle school until she had her son and took time off work to look after him in 2006. Olukemi has worked in many endeavors, some of which are teaching and entrepreneurship. She holds the Florida Real Estate license and practices as realtor in Tampa, Florida. Olukemi loves children and she is head of the Children and Youth ministry in her church. In addition, she is the head of the stewardship ministry. She loves her country Nigeria and she loves children. In 2010, she started the Hitech Courier Services of Florida which is serving Nigerians in Florida by shipping cargo to Nigeria via the air cargo planes. She has a clothing Ministry in which she sends used and new clothing to families in Nigeria through churches. The clothes are donations from friends and families for the ministry. She is blessed to be part of directors of Likewise and happy and ready to go and do likewise to people that she comes in touch with. Kathy Guzman Kathy is originally from upstate New York, where her parents still reside. She grew up serving God and graduated with a Bachelors Degree in Sociology from The Kings College, in 1988. The school is now in located in New York City. She moved to South Florida in 1997 because of a job relocation and completed her Masters in Organizational Leadership from Palm Beach Atlantic University in 2003. Kathy relocated to Orlando in 2004, where she met Ayo and Aji at Faith Assembly of God’s Ministry training program, Faith College, in 2007. Their friendship soon formed because of their mutual passion for worshipping God, serving people, furthering their education and reaching out to those in need. 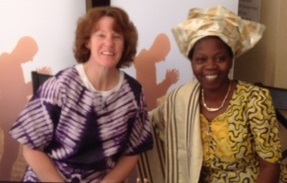 After completing the program, Kathy joined Ayo in Likewise Covenant Ministry as the Treasurer. Kathy completed a second Masters in Business Administration in 2008 and has been an adjunct professor at Palm Beach Atlantic University’s Orlando Campus, teaching Human Resource Management for the past five years. She works in the field of Accounting and Human Resources. She and her husband, Michael, are very involved in serving God at First Baptist Church of Orlando.